The information presented on this page was originally released on January 13, 2003. It may not be outdated, but please search our site for more current information. If you plan to quote or reference this information in a publication, please check with the Extension specialist or author before proceeding. Most of us can hardly wait until the first blooms announce that spring is just around the corner. Over the holidays, I saw a flowering quince with several coral-colored blossoms already open, but you need a Taiwan flowering cherry if you really want to herald the approaching spring. As the name suggests, the Taiwan flowering cherry is from the island of Formosa, as well as China and the Ryukyu Islands off Japan. It is sometimes called the Formosan cherry or the Bell flowered cherry. It is known botanically as Prunus campanulata. The tree can reach 20 to 25 feet in height and produces blooms that are deep-rose pink. January is a great time to plant dormant trees in the landscape, and I promise that it is hard to beat the spectacular bell-shaped blossoms of this flowering cherry. The flower count totals in the thousands and is indescribable when up against the backdrop of green from nearby pines. Plant your cherry in full sun from now through February, however container grown trees can be planted anytime. 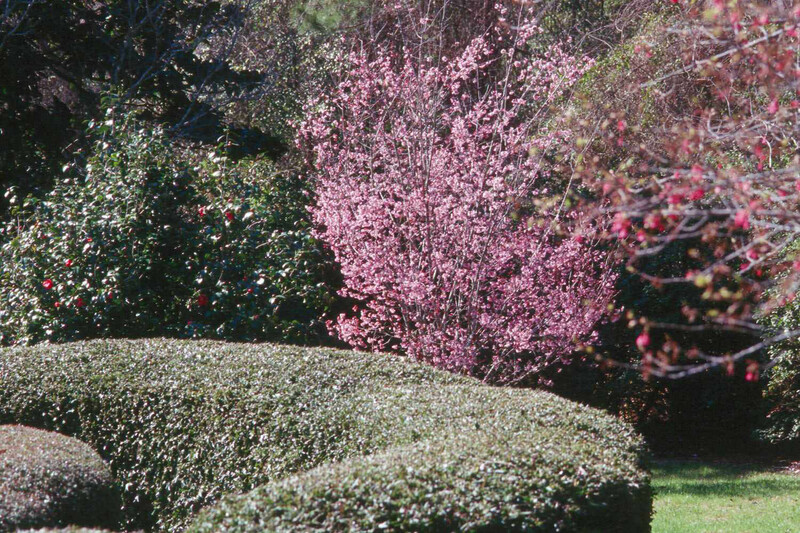 The cherry looks good as part of a well-prepared shrub border with evergreens and spring blooming shrubs. Lawn planting is possible if the drainage is good, but I prefer the shrub border. Space the trees about 12 to 15 feet apart or from other trees like the redbud. The planting hole should be wider than the rootball but no deeper. Wide holes allow for the best root expansion and establishment. Use the extra backfill to form a 4-inch berm beyond the edge of the rootball. It should be large enough to hold five gallons of water. If drainage is in question, don't form a berm. After the tree is planted and berm formed, water thoroughly and mulch. Remove the berm at the end of the first year. Like most prunus species, borers can be a problem, so be ready to treat as needed. Feed with an 8-8-8 fertilizer at 1 pound per 100 square feet in late winter extending from the trunk to just outside the canopy. Water is critical the first year. Water established trees deeply and infrequently. No pruning is required other than to remove crossing branches. The Taiwan cherry provides the first color of the year. Some late freezes may catch this early bloom sequence some years, but it is still a great choice. 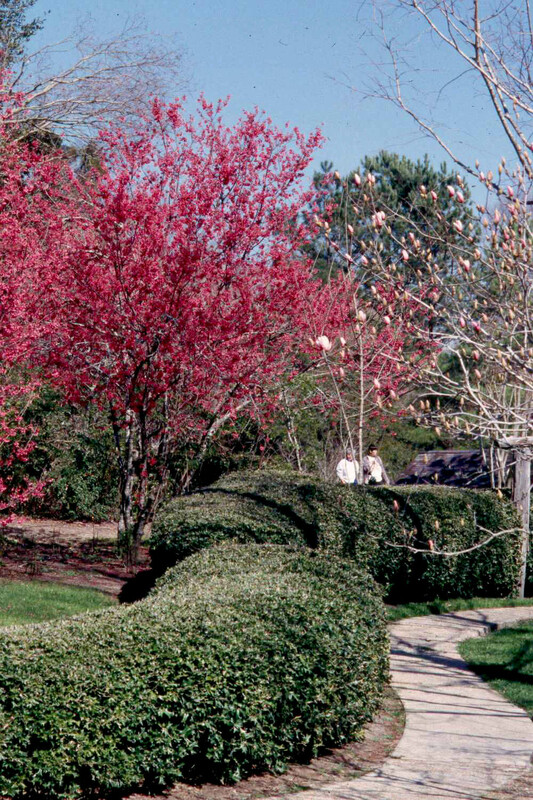 They are the perfect accent in a landscape planned for four seasons. They will bloom before the redbud and even the Japanese magnolia. If you have are located in close proximity to water like a pond or small lake, plant where the cherry blossoms can reflect off the water. Be ready to photograph this spectacular blooming display. The Taiwan flowering cherry is a deep rose color, but look also for the Okame, a pink hybrid crossed with Prunus incisa. Dream Catcher is a U.S. National Arboretum release with bright pink flowers that bloom about a week later. Both the Okame and the Dream Catcher offer additional landscape benefit from fall leaf color. It may be the dead of winter, but now is a good time to plant these dormant spring blooming trees. If you don't, it will be the yard down the street that catches all of the glances when it could be yours.